Every time I turn on the TV these days, I see people running on a track. Skinny people in tight, bright-colored outfits competing in the Olympics. They run fast, determination in their eyes, streaking toward the finish line and a medal that will make them rich and famous. The camera focuses on the runners in the front, the ones who will take home a gold, silver or bronze medal . It does not show us the people in the back, the losers, unless they fall or have prosthetic legs like that amazing guy from South Africa. Yet the people who fall behind and finish the race unheralded also trained hard, also took the hopes of their country to London, also hoped to win a gold medal. Well, in the Newport Walking Club, I’m that person in the back of the pack, walking hard with no hope of catching up with the folks in the front. At least that’s how it was on my first walk. I showed up with my backpack laden with my camera, water, phone, cash, insurance cards, and info about my new book just in case somebody wanted to talk about it when we stopped to chat. Uh no. This was not that kind of walk. This was serious exercise. The group started fast and never slowed down. We walked this amazing trail I didn’t know existed. It runs from the east side of the Agate Beach parking lot through the woods to the Big Creek reservoir. 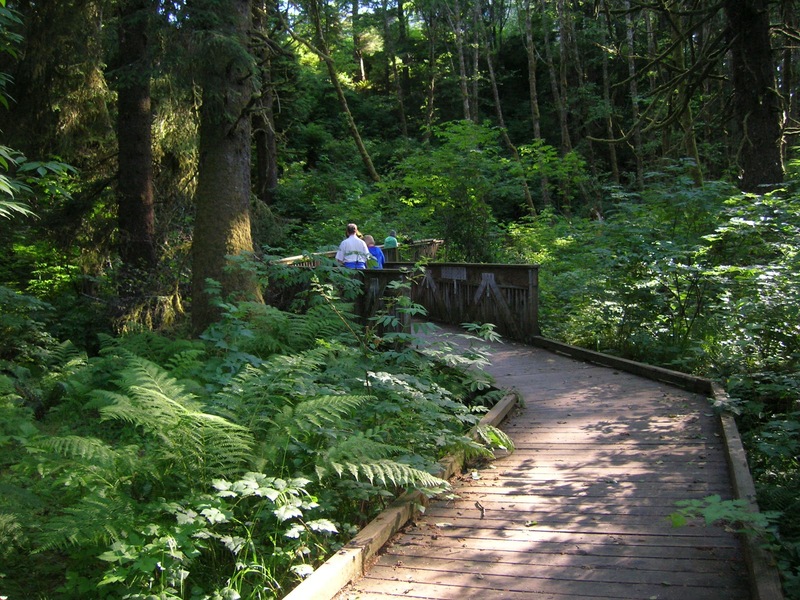 The tree-shaded trail is partly paved and includes numerous wooden bridges over wetlands full of ferns and enormous skunk cabbages. Signs along the way describe the vegetation. After walking about a mile and a half, we emerged on a street that led south to Big Creek Park and the Newport swimming pool and east to the reservoir. We walked along the road beside reservoir. It went on forever. And then we turned around and walked back. Meanwhile, I kept trying to take pictures and read the little signs. Every time I looked up, the group was ahead of me. No gold medals for me. I came in last, but hey, I made it back to the parking lot before everybody left. Afterward, I thought we should adjourn to a bar for margaritas, but no. I guess that would negate the fitness aspects of the walk. Annie and I went back to that path a couple weeks later. She enjoyed a soak in the creek, and I marveled as an eagle flew right over our heads. We both paused often, Annie to sniff, and me to look around at this path I would never have discovered without the walking group. Next time, I’ll leave the backpack at home and see if I can make it to the middle of the group. Gotta represent South Beach. The Newport Walking Club does several walks a week, including noon expeditions in town and longer walks at 5:15 p.m. on Mondays and Thursdays. Recent trips have included walks at Yaquina Head and from Nye Beach to the jetty. This week’s walks include a trip to Idaho Point. Visit http://www.meetup.com to sign up and see the schedule.